On March 22, 2014, a hillside above Oso, Washington collapsed, unleashing a torrent of mud and debris that buried the community of Steelhead Haven. Forty-three people lost their lives, making it one of the single deadliest landslide disasters in U.S. history. Over the past two years, we've learned much about the specific geology of the Stillaguamish River Valley where Oso is located, and the weather that preceded this landslide. One study I co-led identified geologic factors such as weak, saturated ground that made the Oso hillside highly susceptible to landslides. 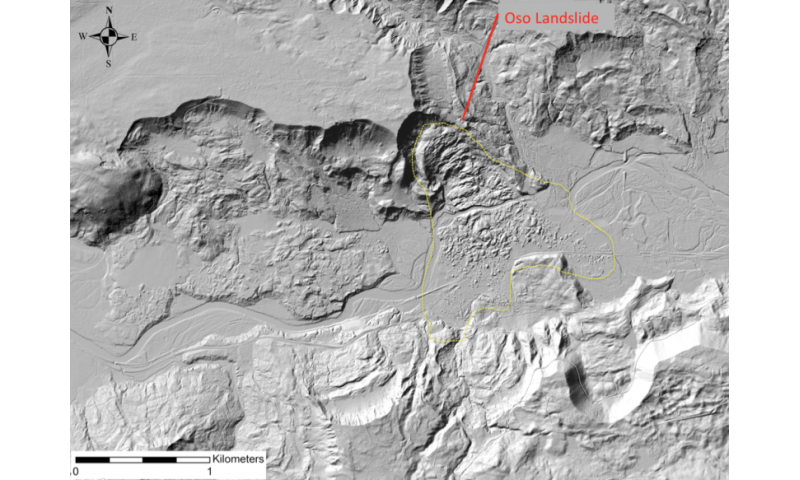 Another investigation found that large landslides similar to the one in Oso occur with surprising frequency in the region – on average, every 140 years, just a flash in recent geologic time. A study of the rainstorm that triggered the landslide found that precipitation in the weeks leading up to the event was only moderately intense, though unusual in its timing during the normally drier early spring season. But important questions remain about other aspects of the landslide. Answering them will not only advance landslide science, but can also help protect other threatened communities around the globe. So what do we still need to figure out? A landslide – the downslope movement of rock or soil – is a natural geologic process that forms and shapes landscapes. Slides occur when downward forces from gravity exceed the strength of soil or rock within a slope – in other words, when the weight of a hill slope becomes too much to bear. Landslides affect slopes across a wide range of settings, but steep terrain is most precarious. Often, it's precipitation or earthquakes that trigger landslides. There are several types of landslides, but most dangerous are flows, which occur when saturated ground transforms into a liquid-like state and inundates downslope areas within minutes. Flow landslides, such as the one at Oso, become disasters when they quickly spill into communities, leaving people virtually no time to escape. Landslides occur worldwide, including in every U.S. state – the U.S. Geological Survey estimates that, on average, landslides kill 25 to 50 people across the country each year. The global toll is much worse. During the seven-year period ending in 2010, landslides killed over 32,000 people worldwide, mostly in densely populated mountainous areas with intense rainfall, such as in Asia and Latin America. Knowing that some regions are more susceptible than others, can we minimize the potential damage from future landslides? Do human actions contribute to landslides? We've learned a lot about the geologic aspects of the Oso landslide, but aside from nature, could human activities also have played a role? We know that human actions can contribute to landslides, especially when natural topography is altered to create oversteepened, unstable landscapes, as was the case in a recent disaster in China. For many decades, anecdotal evidence has suggested that logging on or near hill slopes contributes to their collapse by reducing reinforcement from roots and by altering ecosystems to allow more precipitation to enter the ground. As early as 1930, after a slide occurred in the Oso region, Washington state's game director noted that "Many people feel that this earth movement was triggered by the intense logging of the forest cover of the land and resulting erosion." A 1988 study of the area found that timber harvesting does increase surface water infiltration to the ground, which can destabilize hillsides. Yet it is clear that landslides bearing a striking resemblance to the 2014 event in Oso have occurred in the region for at least 2,000 years – long before large-scale timber harvesting began. Though indications are that logging can make some slopeside regions more susceptible to landslides, geologic evidence of earlier slides near Oso makes it unclear what role, if any, timber harvesting played in this event. Regardless of whether human action has a hand in setting off a particular landslide, its effects may be felt by anyone who lives downslope. And we still don't have a good grasp on the interconnected human, social and political factors that lead people to put down roots in dangerous places. Is it because of their lack of scientific understanding or access to incomplete information? Or is existing knowledge simply incomprehensible to public officials and ordinary citizens? At Oso, the Steelhead Haven community, which was established in the early 1960s, continued to expand even as smaller landslides occurred there during the 1990s and 2000s. In the face of continued threats from landslides, how did residents weigh risk against the cost of abandoning property – and the cherished community that bound them together? The issue is not unique to Oso; in the decade since a landslide killed 10 people in La Conchita, California, that community, too, has continued to grow. As a La Conchita resident recently lamented, "Where else am I going to go? This is my home." So even as our understanding of the natural science aspects of the Oso landslide increases, there is still much we don't know about the interface between landslides and people. Questions of this nature are complex, multidisciplinary, sometimes contentious and not easy to answer. But they're important and go beyond scientific curiosities. Indeed, they touch upon issues that are central to land-use planning, resource management and public safety. There is no doubt that some of these questions will soon be raised in the Washington state courts, where these issues – alleged destabilization from logging and siting a community in a hazardous area – are central to some of the pending litigation; however, juries are often not ideal arbiters of scientific issues. Questions about logging and land-use in hazardous terrain lie at the intersection of the natural, social and applied sciences, so multidisciplinary research will be needed to better understand these issues. And understanding alone will not be enough to save lives and reduce losses. We must also have the political will to translate knowledge into practice through effective public policies.